I love bacon. It is crispy deliciousness that can add extra crunch and flavor to any dish. Cooked chicken breast can be pretty boring at times but when cooked properly and paired with the right ingredients, it can become quite tasty. I was scouring my cabinets one day and thinking through the ingredients I had on hand and thus came up with this dish. I saw the carrots sitting in my fridge and was hoping I could prepare them in a way that my toddler would find yummy. He won’t eat many vegetables but he is always willing to take a bite of something new. If he doesn’t like it, he spits it out but I can appreciate a two year old who will at least entertain the idea of a new food! I had chicken, bacon, and garlic on hand so I got out the cast iron skillet and began to prepare my ingredients. I buy my chicken breast at Sam’s club in bulk and freeze the unused portions. I buy the member’s mark brand because the price point is lower. 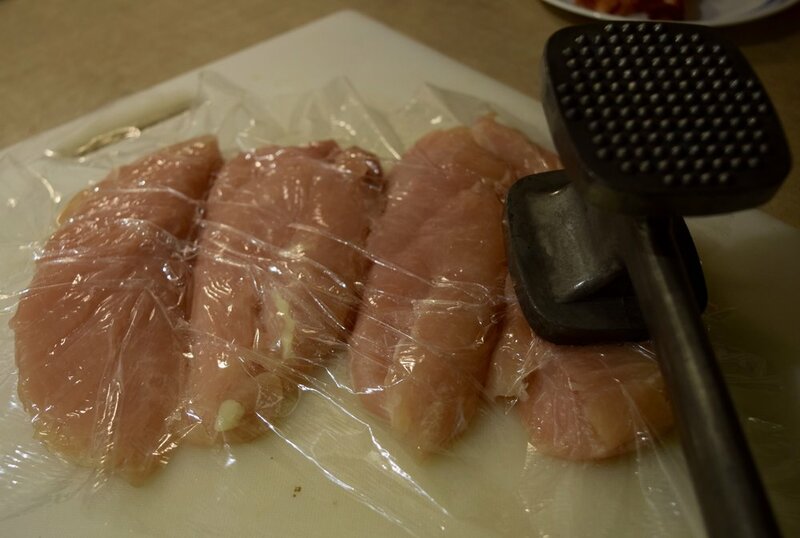 I have found the chicken to be a bit on the tougher side so I always pound out the chicken breast before preparing it. The packaged chicken breasts are also HUGE and way more than one serving so I cut mine in half to reduce the size and cooking time. This dish is finished in the oven so I preheated my oven to 400 degrees F. I then minced the garlic and sliced the carrots into dime-sized medallions while my two slices of bacon were cooking in the cast iron skillet. I could have left the carrots whole but it would just take longer to cook and I am all about saving time. Once the bacon was crispy, I placed it aside and removed some of the bacon grease from the pan but reserved enough to cook my carrots in. I sautéed the garlic in the bacon grease for about 30 seconds until fragrant and then threw in the carrots over medium-high heat. It took about seven minutes to get the carrots browned and tender. I threw in about a tablespoon of brown sugar and a tablespoon of butter to coat the carrots. Once the glaze had formed, I removed the carrots from the pan and set them aside. In the same skillet, I added about a teaspoon of olive oil over medium-high heat. A cast iron skillet is great for searing because it holds heat so well but the downside is that the temperature usually continues to rise so I find myself turning down the heat to avoid my food getting burnt. 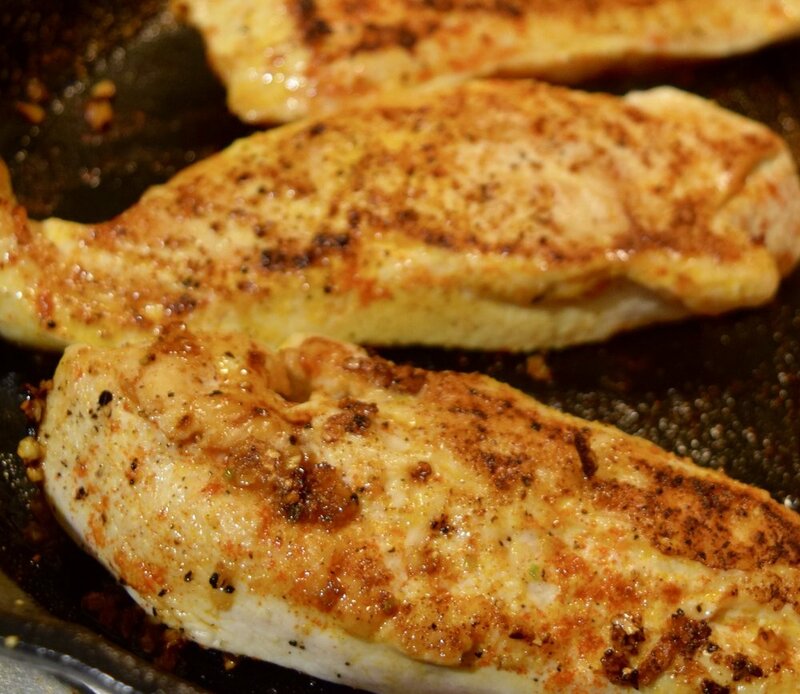 If you aren’t using a cast iron skillet, just make sure your pan is still hot before cooking the chicken; otherwise you won’t get a good sear on the meat. I usually do the water drop test and if it sizzles on the pan, I know it’s ready for cooking. I seasoned my chicken with salt, pepper, garlic powder and Spanish smoked paprika. The smokiness from the paprika adds another dimension to the dish that I love. I seared the chicken for about three to four minutes on each side. While my chicken was searing, I roughly chopped the bacon. I then placed the carrots back in the pan and sprinkled about 2-3 tablespoons of brown sugar on top along with two tablespoons of butter. I garnished the top with the chopped bacon and put the skillet in the oven along with my meat thermometer to ensure my chicken is cooked through. . My chicken was pretty much done before placing it in the oven because they weren’t thick chicken breasts but I use the oven to caramelize the brown sugar and butter on top. I left it in the oven for about 5 minutes until I saw the glaze had formed. And the juices at the bottom of the pan had also turned to a glaze and were bubbling. Voila! A one-pan meal is always a bonus because it’s less clean up. A word from the wise though is to clean out your cast iron skillet immediately after serving; otherwise you’ll have cooked on stickiness that is hard to clean off once cooled. My husband and I loved this dish and my toddler loved the chicken but unfortunately the sugar wasn’t enough to cover up the taste of the carrots for him. So it’s on with the search for new vegetable recipes that he will eat! I’ll keep you posted on that saga in some later posts!